The creation of art in the public realm, usually in the context of commissions for Municipal and Local Authorities, is a mean by which many artists earn their income. For several years much of my work was created in this context. While it is a realm that can be fraught with compromise and bureaucratic challenge, when its impulse is genuinely public or democratic, and the process with the host community and the commissioner is collaborative, then the creative engagement can be very rewarding indeed for all concerned. Over the past twenty years I have realised eighteen Per Cent for Art commissions in both Ireland and the USA. 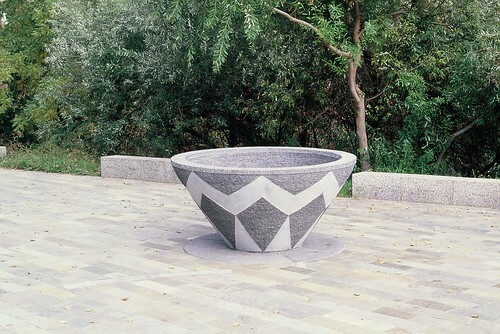 There have also been several large-scale private commissions for public spaces. The following are but a few examples of that engagement with municipal or public spaces. The first public commission I received in Ireland was in 1993 for Waterford County Council. 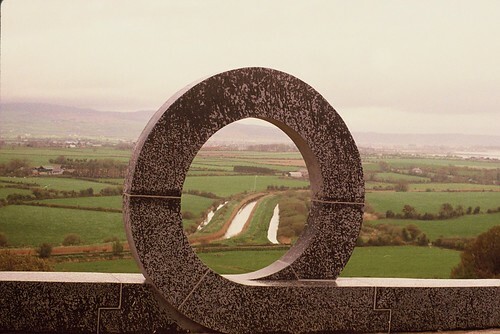 Situated in a lay-by on the new N25 road realignment near Dungarvan Co Waterford, the site offered remarkable views over the town’s hinterland and the Monavullagh and Comeragh mountains. This work, Falla na Síoga (The Wall of the Faeries) created in limestone, was raised as a lens onto that wonderful landscape. Another work created in 1993 was Brothers. It was commissioned by an individual to express a close relationship to a terminally ill family member. Fruit forms which suggest the ineluctable phases of life seemed appropriate for the site and for their location beneath spreading chestnut trees close to the majestic ruins of Boyle Abbey in Co Roscommon. 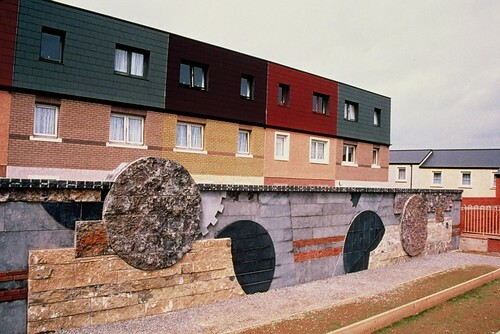 An example of a process where the community had a large role in the creation of the final installation was the following sculpture, A City Wall, in Mayfield, Cork. 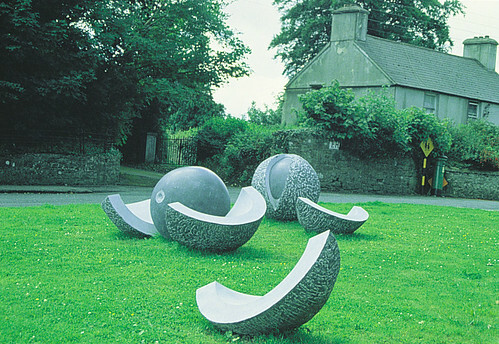 Commissioned by City Architect, Neil Hegarty, this work was part of an enlightened process of urban regeneration which resulted in a marked decrease in anti-social behaviour. In this instance I was invited to create a sculpture out of a boundary wall between two estates. Central to the success of the work was the involvement of the community who were invited to carve individual bricks which were then incorporated into the overall design. In this way the children became the guardians of their own creations. Some works have become iconic landmarks such as this one at the entrance to the Municipal Wharf in Santa Cruz, California, USA. 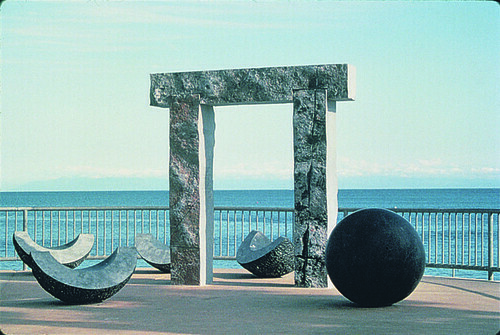 Entitled In the Tides of Time, En las Mareas del Tiempo, it was created in Kilkenny Limestone as a portal on the edge of the Pacific Ocean. At the time of its creation there was a Bill under consideration in the State Legislature to limit the rights of immigrants who are central to the life and culture of California. As one such immigrant I incorporated a verse on the inside of the portal with its spanish translation on the other. In the tides of time/we have found safe harbour/ here, on this western shore/ where the winds ebb and flow, endlessly/ and the seasons, in their old harvest hulls/ have borne us ripe cargoes of plenty/ with enough fruit for all. Perhaps the most challenging commission I have realised was for the City of San Jose, California, USA. In development for two and a half years it was finally installed in 2001. The Weavers’ Gifts was commissioned to “commemorate” the Costonoan-Ohlone Indians of Central California. Preferring to celebrate a people who were engaged in the re-establishment of their cultural identity after more than a century of cultural oppression the work seeks to express a culture in the process of growth. The central metaphor is that of the basket which was the central cultural object of the Ohlone people and through which they gave, and still give, remarkable aesthetic expression. 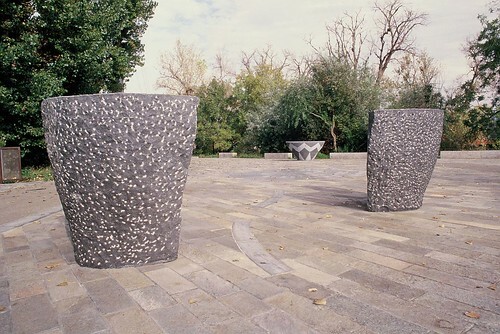 Created from Irish blue Limestone, the work is located at the confluence of the Guadaloupe River and Los Gatos Creek on an old settelement site of the Tamien-Ohlone people. It is laid out on a central axis with a form representative of a traditional Gift Basket at one end and a broken mortar at the other. 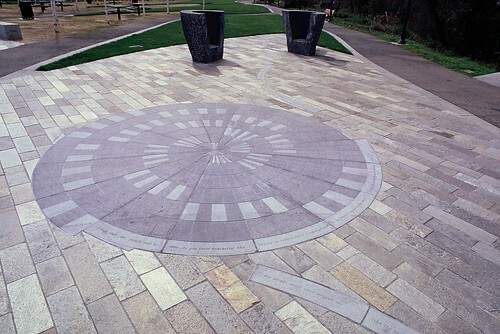 The central element, placed within the park pavement, represents the central metaphor of this work. The basket portrayed in the spiral weave is unfinished, ongoing. Herein lies the informing idea of this sculpture: that the history of the Costanoan-Ohlone peoples is, like the spiral basket, still in process. It is more than a collection of past idylls and tragedies. The culture is still being formed by Costanoan-Ohlone descendants today. The future is yet to be woven. This work entailed a huge amount of historical research and community engagement. The fruits of this research, especially in the retrieval of Costonoan-Ohlone vocabularies, were incorporated into the text bands which flow into the central spiral form from the river banks. While this commission entailed a very large budget, it also involved a great deal of controversy and challenges. There were fractious relationships between the various tribal groups with whom I engaged and between some tribal groups and the commissioners. While those native americans who took part in the process were proud of the work and thereby of official acknowledgement of their existence there were others who wondered how a commemorative sculpture to a Native-American people could be awarded to a white European in the first instance. 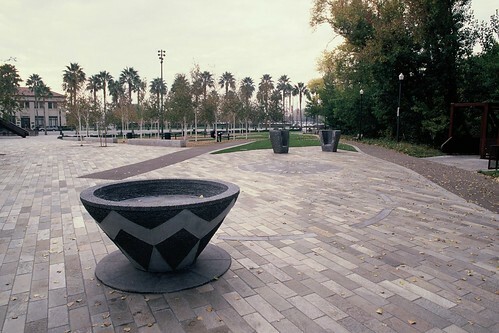 The City of San Jose never held an official dedication for this work. While I, as the creator of the work, was greatly disappointed at this, there was little surprise within the native-american community. The back story to this commission is a most interesting one which I am in the course of developing into an illustrated essay. I anticipate this will prove of interest to anthropologist and ethnographers alike as much as to all those who engage with the creation of art in the public realm. When complete, the article will be available for download from this page in pdf format.